A quick 40 minutes in the morning spent drybrushing Makoto's Mighty Fortress model, and we have a new castle to attack! 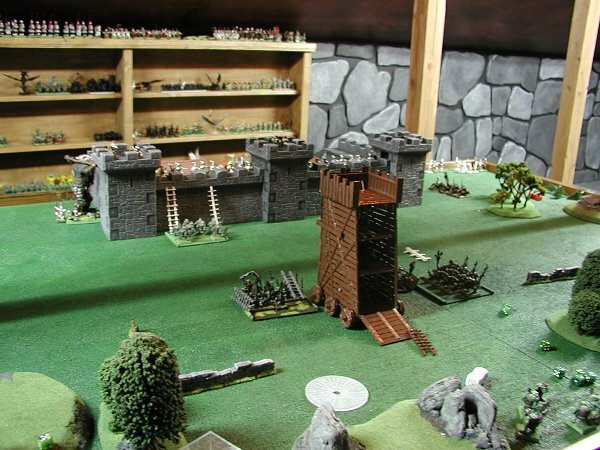 Our newly-arrived siege equipment (siege tower and ladders etc) were put to good use in two very tense games today - Empire vs Orcs, and Goblins vs Ogres. A very tense 7-turn game, pitting 1000 points of attackers against 500 points of defenders. The Empire's Helblaster cannon misfired on the first turn, and spared several units painful death - if only for a while. Goblin Spider Riders quickly scaled the corner tower walls, overwhelming the Empire archers, only to flee shortly after. 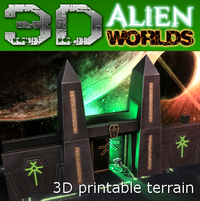 They gained one more chance later on, when they rallied and again threatened to break into the courtyard - only to be blasted apart by the repaired Helblaster cannon, firing from the middle tower against its own corner tower. Ouch! Meanwhile, the Orc giant on the far left has successfully assaulted the other archer unit, but seemed content to pick them up one by one and stuff them into his lunchbox for later. Being too large, he couldn't get into the castle anyway! The central orc attack turned into a complete farce, as animosity and panic tests took their toll. The siege tower was abandoned as too slow, and the ladder units only reached the walls on turns 5. 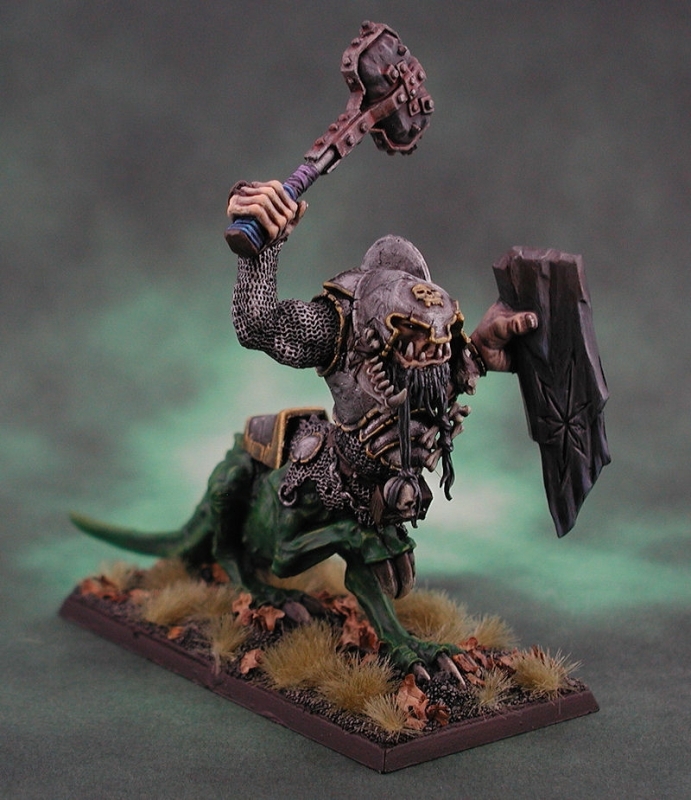 Twice the Orc Big'un elites fled from the attack and were outdone by lowly nightgoblins, one of whom survived 5 attacks against him over three turns, and even killed a defender (remember that attackers need 6s to hit!). Another tense game that hung in the balance until the very last turn. A horde of goblins had obviously sneaked into the castle on the Empire's lunchbreak, and were now defending against a horde of hungry ogres! Cunning spider riders tried a preemptive strike by climbing down from the battlements and sneaking off towards the ogre flanks. This proved to be a mistake, as a harpoon promptly skewered 3 from their saddles. The unit fled in panic, leaving the castle's flank unguarded! It went from bad to worse in the second turn when the goblin stonethrower blew itself up, leaving the castle's side even more indefensible. The Yhetees swiftly scrabbled up the empty walls only to find their way blocked by a dribbling troll, who had been lurking in the gateway out of site. 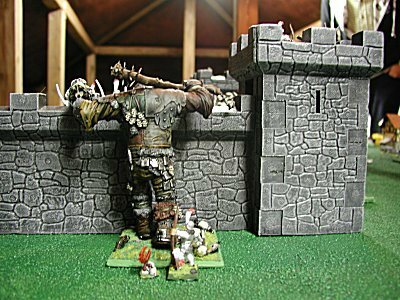 Ogre units quickly thumped into the castle gates with a huge battering ram, and despite cracking the gate timbers they were repelled by a well-placed cauldron of boiling oil and stones dropped by the defending goblins. A second unit ran forward to pick up the ram and slammed into the gates again, leaving it hanging precariously. This second unit also panicked under the hail of hot oil and rocks, and ran back a few paces. The general stepped into lend some muscle and this time the gates were rammed aside, allowing the general and two bulls to squeeze through. Amongst all this excitement we were now given a moment to laugh ourselves silly, as the Ogre Scraplauncher blew itself up. For five turns this inept gnoblar crew had misfired three times and even hit itself once! A fitting end for a useless bunch of gnoblars! In the final turn of the game, the general charged into the courtyard but not quite far enough to make it off the table edge and win the game. The Yhetees up on the ramparts were still slogging it out with the lone troll, but didn't quite manage to kill him. So they too didn't quite make it off the board. We called it a draw, as the goblins would have been dead'uns after that! So, two great games, each taking about 150 minutes to play. We found that despite early expectations, the game was very well balanced for both armies, and both games pretty much came down to the seventh turn. Can't wait to try more!